You may have your own opinion about the President’s demand for a wall on the southern border. But when people started referring to it as a ‘medieval’ wall, an expert on the era from Virginia Tech, weighs in on the historical accuracy of that comparison. President Donald Trump’s demand to build a wall on the southern border has not only led to a government stalemate, it’s also misrepresenting history. Mathew Gabriele teaches medieval studies at Virginia Tech, so he knows a lot about the walls that were built around cities and castles in the middle ages. Gabriele says walls in those days were never meant to keep people permanently out. The idea was more like locking your door at night. After everyone went to sleep, they closed the gates. “But the gates to those walls were always open during the day and that was the whole point, to allow people in. Most people worked in the country side, they traded with neighboring towns and cities, so you needed people to move between those spaces very easily." Remnants of Constantinople’s “Theodosian Walls,” built in the 5th century CE. Gabriele says, the walls of the middle ages often had several gates. Though they might be closed in times of siege or some other emergency, they also helped attract and concentrate a mix of commerce and cultures, the way modern cities do today. 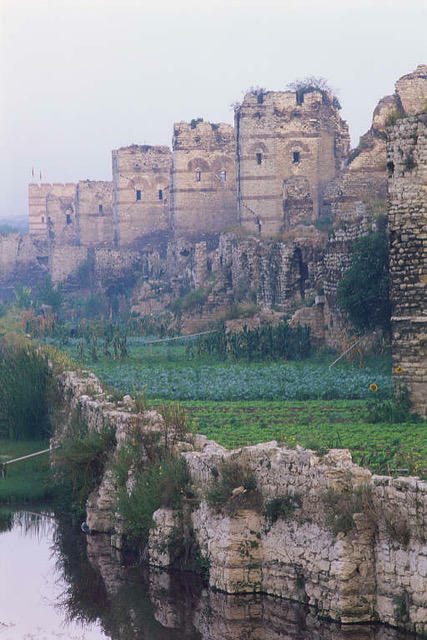 And though only the remnants remain, some of them were as exquisite as a fairy tale castle, Matthew Gabrielle shot a picture of in Istanbul, Constantinople’s “Theodosian Walls,” built in the 5th century. Forty percent of people say they support the idea of a border wall, while 58 percent oppose it, according to a Pew Research Poll out last week.